Once again it's Friday (already?!?!) That means it's Fabulous Freebie Friday! Head over to Sassy Studio Designs on Paper Craft Planet and pick up a FREE Sassy Studios image (click here), it will only be available 24 hours. Today we have another wonderful holiday image to share! It's called "Hanging the Wreath". 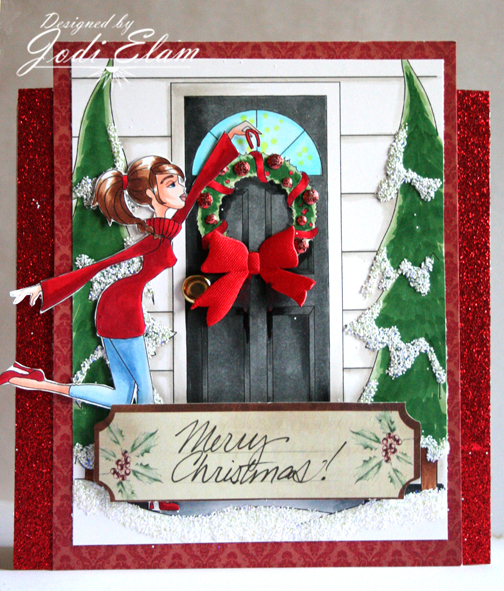 Our challenge for this fortnight is "Deck the Halls"! (these challenges run for 2 weeks) Create any project that features a Sassy Studio Designs image and use 3 or more different embellishments on it! Remember you MUST use a SSD image to play along, bonus points if you use one of the freebies, of course. So grab the freebie, and we hope you'll play along!! This is week 2, so you still have time to get in on the fun. I combined "Hanging the Wreath" with one of the backgrounds we had recently, "Home for the Holidays". I used Copics to do the coloring, i-rock glittery nail heads as baubles on the wreath, a brad for the doorknob, a ribbon for the wreath's bow, glitter tape and Hint of Violet Glitter Frosting by Flower Soft for the snow. Enjoy and don't forget, you only have 24 hours to get your freebie! 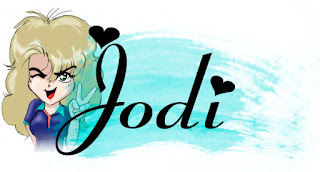 Jodi, this is fabulous! I love that you combined both those images together. Great idea! Really enjoying all the dimension on this card and the way you created your scene. Beautiful Coloring as always but I really love your scene especially the details of the snow.